Covered Sandbox Kits | Built It Yourself | Free Shipping! A covered sandbox is a great children's gift. Covered sandboxes will stay clean because the cover keeps out animals and lawn refuse. 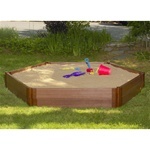 We offer easy to assemble covered sandbox kits in various shapes and configurations. Choose from covered sandboxes as small as 4' x 4' to as large as 10' x 10'. 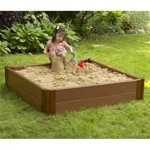 All covered sandbox kits seen below are offered with free shipping and handling! If you have any questions about the product you see here, please feel free to call us at 800-690-0132, Monday through Friday. We're always happy to answer your questions and take orders by phone. Home Products n' More prides itself on offering the best quality products for your home and garden. For outdoor living areas, check out our constantly expanding line of outdoor furniture. We have a variety of benches, Adirondack chairs, gliders, and porch swings to choose from. We offer outdoor furniture in heavy duty vinyl, high grade recycled plastic, and log cedar wood. Or, create your own look with some of our garden bench kits---the kit includes the plastic bench ends and hardware, and you provide your own wood or plastic 2x4's to complete the kit! A great option for playgrounds or commercial settings, and also a great project for kids to help with. Home Products n' More also offers a variety of pergola designs, garden trellises, and arbors to grace your yard. Give those climbing plants a place to go with a new arbor! An arbor is the perfect transition from a side yard into a backyard, and it also makes a beautiful backdrop for a wedding. We offer white vinyl arbors in high quality PVC vinyl with a lifetime warranty. We also offer a variety of trellises in wood, vinyl, or aluminum. Aluminum may seem like a unique material for a trellis, but it's a great choice! Aluminum is very strong, yet lightweight, and it will not rust.